As Dean Shiels saluted the home crowd before embracing manager Allan Johnston, it was clear who this Dunfermline triumph was dedicated to. The midfielder has had to endure a lot since being subjected to on-field abuse about his missing eye during a derby between these sides in October. He was the target of booing and vile chanting from the Falkirk fans about his sight, with the visiting supporters also throwing rubber eye balls onto the pitch during the second-half. However, victory, secured courtesy of goals in each half from Nicky Clark and Declan McManus, was the perfect riposte and the home fans raucously acclaimed the former Rangers and Hibs player at the full-time whistle. “I’m absolutely delighted,” said manager Allan Johnston. “That’s the way to start the new year, against your rivals, getting a win and putting in a really good performance as well. I don’t think anybody could say we didn’t deserve that. It is understood both squads were addressed by police before the game to appeal for on-field calm and some would have been wondering what they had stepped into. Dunfermline had former Queen of the South and Rangers goalkeeper Lee Robinson making his debut after being signed because of an injury to Sean Murdoch, whilst Falkirk fielded three new recruits, in the shape of former Partick Thistle skipper Sean Welsh, on-loan Sunderland youngster Andrew Nelson and former Sunderland defender Tommy Robson. Given the most recent unsavoury episode in this rivalry, it was a relief the first-half passed off without any major incident. Thankfully, the moment that lit up an absorbing encounter was Clark’s goal. The striker, wearing the captain’s armband for the day in the absence of the suspended Callum Morris, had stabbed a shot marginally past after just 35 seconds to spark a dominant opening period for the Pars. Jean-Yves M’voto had a header tipped round the post by Falkirk keeper Robbie Mutch in the third minute, before McManus then failed to get the better of the visiting goalie from the angle of the box. However, with 15 minutes on the clock, Mutch will feel he should have done better for the opener. The Falkirk defence backed off as McManus drove at them and when he fed Clark on the right the striker arrowed his shot through Mutch’s attempted block and in off the far post. Clark twice went close before Falkirk enjoyed a flurry of activity around the home goal as the half came to a close. Aaron Muirhead’s drive from distance was beaten away excellently by Robinson, who then got his fingertips to Louis Longridge’s effort after the on-loan Hamilton Accies attacker was played in by a wonderful through ball from Jordan McGhee. 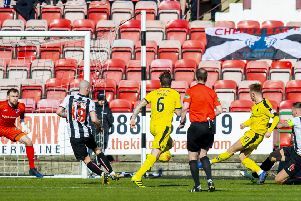 Within five minutes of the restart, Dunfermline effectively secured the win. Joe Cardle flicked a cross into the heart of the box and McManus reacted swiftly to stab in from close range. Thereafter, Cardle struck the post with a deflected drive and Falkirk substitute Rory Loy had a penalty appeal waved aside before team-mate Reghan Tumilty hit the upright in injury-time as the Pars saw out a victory to savour.